Wonder Where San Diego’s Redevelopment Money Went? Since the statewide dissolution of redevelopment agencies in 2011 Katheryn Rhodes, a local advocate for homeless people, has been speaking up at City Council meetings about the millions of dollars that could be used to address homelessness that the City is letting slip away. You’d think that someone suggesting that there is money available for a problem that is starved for adequate funding, would get an eager audience. Problem is, no one seemed to understand the reams of spreadsheets and data the soft-spoken Rhodes provided to support her claims. You’d think that someone suggesting that there is money available for a problem that is starved for adequate funding would get an eager audience. At a recent event, I told City Councilmember Gloria that I believe Rhodes claims have merit, but I’m at a loss how to explain it. He sighed, admitting no one seems to be able to figure it out. That’s actually progress because for the past five years eye-rolling has been the usual response to Rhodes’ requests to consider her findings. Reasonably smart people, myself included, assumed that since they couldn’t make sense of the myriad of acronyms, encumbrances and legal requirements Rhodes offered to support her claims, that she is either a financial savant or a flake. No one likes to admit that something is too complex for them to comprehend. Then there was the fear that the confusion was hiding misappropriation of funds, or culpability of some sort. Then there was the fear that the confusion was hiding misappropriation of funds, or culpability of some sort. No one in government was eager to uncover something that could come back to bite them. Even when the numbers Rhodes calculated started increasing to the hundreds of millions, perhaps a billion, a lot of people just hoped Rhodes would give up and go away. Even when the numbers Rhodes calculated started increasing to the hundreds of millions, perhaps a billion, a lot of people just hoped Rhodes would give up and go away. But the count of homeless people downtown (a fraction of those actually homeless) rose 26% last year, and with vacancy rates close to 0%, those who are working to solve the housing problem started looking more closely at Rhodes’ numbers. This week, thanks to the persistence of Amikas board member, Christina Imhoof, I sat down with Katheryn Rhodes, Kyra Greene of CPI and Imhoof, to try to understand where the former Redevelopment Agency money is and why the City’s homeless programs haven’t been getting any of it. After two hours, in a room quiet enough for me to hear Rhodes’ soft-spoken and patient explanations, and Greene’s helpful “translation” of the jargon and acronyms, I finally started to get it. Now my challenge is to explain it to the people who can finally do something with this information. When I’m finished, I don’t want to hear from another City Council staff person that Rhodes doesn’t have her facts straight. I’ll give it to you in digestible pieces over the next couple of months so we can all understand the situation and hopefully provoke the changes that could put more money in programs for homelessness and affordable housing. First, let me start by expressing my admiration and respect for Katheryn Rhodes for figuring this out and persisting in the face of being disregarded for years, and for her passion to end homelessness. This column focuses on the distribution of funds from the City of San Diego’s former Redevelopment Agencies (RDA) following the state mandated dissolution of redevelopment agencies in 2011. Since the early 50’s, by declaring an area or areas as blighted and in need of urban renewal, local governments (a city, county, or a combination of both,) in California could capture most of the growth in property tax revenue (“tax increment”) for the project areas to be invested in the Redevelopment Areas. In 1978, Proposition 13 capped the general-purpose property tax rate at 1 percent, while also constraining local authority over many other local revenue sources. In June 2011, the State Assembly enacted ABX1 26, which imposed an immediate freeze on RDAs’ authority, dissolved RDAs (effective October 1, 2011), and outlined the process by which RDAs would be wound down. Contrary to some misconceptions, the State DID NOT steal redevelopment funds following their dissolution in 2011. The City of San Diego’s redevelopment efforts were administered by two quasi-independent non-profit agencies, the Centre City Development Corporation (CCDC) and Southeastern Economic Development Corporation (SEDC). Per City Council Policy, 20% of redevelopment money was supposed to be set-aside to the San Diego Housing Commission’s (SDHC) Housing Trust Fund to be used specifically for Low/Moderate Income Housing. In reality, except for a small amount in 1993 and 1995, there is no record of money going into this trust fund. We’ll look at that in a future column. As part of the 2011 Budget Act, and in order to protect funding for core public services at the local level, the Legislature approved the dissolution of the state’s 400 plus RDAs. After a period of litigation, RDAs were officially dissolved as of February 1, 2012. As a result of the elimination of the RDAs, property tax revenues are now being used to pay required payments on existing bonds, other obligations, and pass-through payments to local governments. [emphasis added] The remaining property tax revenues that exceed the enforceable obligations are now being allocated to cities, counties, special districts, and school and community college districts, thereby providing critical resources to preserve core public services. To help facilitate the winding down process at the local level, Successor Agencies have been established to manage redevelopment projects currently underway, make payments on enforceable obligations, and dispose of redevelopment assets and properties. While most City and County Successor Agencies have assigned the above responsibilities directly to City staff, San Diego’s City Council has subcontracted this responsibility to Civic San Diego, a non-profit entity that retained most of the CCDC leadership and staff. At the time of this writing the CivicSD.org website was down, but on the cached home page it described itself as “a city-owned non-profit that is the entrepreneurial development partner for targeted urban neighborhoods. We are a one-stop shop with a Neighborhood Development Toolbox that lets us move quickly with public-private development projects and programs.” Whatever the hell that’s supposed to mean! There are a lot of people questioning Civic’s dealings but I’ll focus on their primary reason for existing – to do the job of the successor agency – to manage redevelopment projects currently underway, make payments on enforceable obligations, and dispose of redevelopment assets and properties. And I might add that we would expect them to be doing this in a way that is in the best interest of the City of San Diego and its citizens. Property taxes are paid to the County and distributed based on a formula from the state to the General Funds of all taxing entities in the county, including Cities, County, Schools, and Special Districts. Redevelopment Tax Increment Revenues are deposited into the Redevelopment Property Tax Trust Fund (RPTTF) (See illustration). These funds are supposed to be used to make payments on enforceable obligations and for administrative costs (which can be up to 3% of the value of the enforceable obligations). The Successor Agency’s spending plan must be approved by the Department of Finance (DOF). Twice a year the RDA Successor Agencies (in this case the SA subcontractor, Civic San Diego) submit a Recognized Obligation Payment Schedule (ROPS) to the State Department of Finance. This is the unwieldy document that Ms. Rhodes has been asking us to look at. The ninth ROPS that Civic San Diego recently filed for January 1 through June 30, 2016 has 630 line items and 312 pages. The Adjusted Current Period Redevelopment Property Tax Trust Fund (RPTTF) funds requested total $67,988,568. [T]he successor agency is paying a high rate of interest on money that is sitting somewhere collecting a very low rate of interest, resulting in unnecessary negative arbitrage costs. The Department of Finance will review the requests and disallow some line items. Examination of the ROPS shows many new line items requesting RPTTF funds, when there are available Bond Proceeds, Cash Reserves, and Other Funds Accounts (OFA) that could be used for the project. Rhodes explains one reason why this is “nuts”. The column titled “Total Outstanding Debt or Obligation” shows funds the City has borrowed and is paying interest on. This money could be used for redevelopment projects. In fact, the ROPS shows that the Redevelopment Successor Agency (San Diego City Council) has $1.67 Billion in debt. For portions of this long-term debt the successor agency is paying a high rate of interest on money that is sitting somewhere collecting a very low rate of interest, resulting in unnecessary negative arbitrage costs. We should be using this money for the purpose it was borrowed or using it to pay off the debt. Instead Civic San Diego seems to be ignoring it. Why? That’s the billion dollar question. DOF will most likely deny the requests for RPTTF funds that are not going to pay down debt, due to the failure to spend existing cash on hand first. Then there will be a “Meet and Confer” where Civic San Diego can argue for the line items that were denied, and propose new line items or changes in existing line items to maximize the funds staying within the City. Failing to convince, the amount not approved is reclassified as RPTTF Residual Distributions. We have no idea how much money is currently in Unencumbered Bond Proceeds, Cash reserves, and Other Funds Accounts (OFA), and if any of it can be used for new projects. Basically what you are looking at is “Use It or Lose It” to the tune of $66 million last year alone. That last item is another number that Rhodes has been flagging. “Basically what you are looking at is “Use It or Lose It” to the tune of $66 million last year alone,” she explains. Instead of listing that money on the ROPS to pay down debt, $66 million that had been earmarked for the City of San Diego’s redevelopment areas, went back to be distributed to all of the San Diego County taxing entities, with the City of San Diego’s General Funds getting only 17.5 cents on the dollar. True, you might say, these other Taxing Entities (see illustration) could use that money too. But these funds get distributed mid-year and were not part of the taxing agency’s budget and therefore were not planned for. [C]an we add these programs to the Recognized Obligation Payment Schedule and have them approved by the Department of Finance? If that’s possible, we’d have 100% of the funds to put toward these programs instead of the 17.5 cents per dollar we get out of the Residuals that goes into the General Fund. It remains unclear if the City could legally pay for affordable housing projects, shelters or other programs that would benefit the poor directly out of the RTTPF. In other words, can we add these programs to the ROPS and have them approved by the DOF. If that’s possible, we’d have 100% of the funds to put toward these programs instead of the 17.5 cents per dollar we get out of the Residuals that goes into the General Fund. Hundreds of new line items have been added to the ROPS since the original application in 2012, which seems to indicate that at least in the past, new projects were approved. Hopefully, with this clarification, City staff will be willing to look at this more closely and get some answers. If, in fact, the DOF will not approve new or different spending, we should be spending RTTPF funds to pay off the debt as was the directive when creating the Successor Agencies. 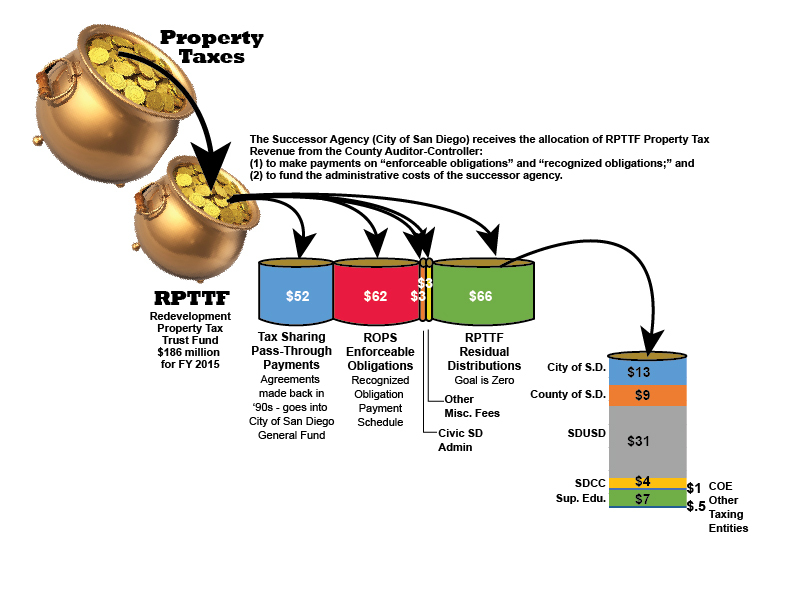 This would eventually increase the amount of RTTPF Residuals being distributed to the taxing entities of which the City of San Diego would get 17.5 percent. Then our job would be to make certain that goes to affordable housing and programs for ending homelessness. While there are still unknowns, the alarms Katheryn Rhodes has been ringing deserve to be heard. “move quickly with public-private development projects and programs.” Whatever the hell that’s supposed to mean!” Civic San Diego as the follow on to CCDC basically does, it seems to me, what CCDC did: put together huge projects (that’s the public part) in which private developers (that’s the private part) build new apartment buildings and condos. The CCDC really didn’t do anything to alleviate homelessness except to “study” it. No money was allocated. Civic San Diego is continuing on in this same spirit. Identify a “blighted” area. Buy up several parcels creating one big parcel and sell it to a developer. None of these agencies or entities actually wants to spend millions of dollars on what would amount to public housing to house the homeless. I’m like you, and wonder if I can understand anything about public and private accounting. So I wonder, when you say, agencies “request many new line items… when there are available Bond Proceeds, Cash Reserves, and Other Funds Accounts (OFA) that could be used for the project” that the various successor agencies will borrow money when in fact they have no need to. That’s like paying interest to a bank when you have the cash in your own accounts. If I did that I’d expect people to call me a fool, not elect me to public office. But, then, Civic San Diego fools are not elected, they’re appointed by… Mayor and Council. Sounds like some council members and a mayor might take their jobs more seriously. Thank you Jeeni for giving Katheryn Rhodes the recognition she deserves. She has been a voice crying in the wilderness for too long. I have carefully studied her work for many years and have never known her to get her facts wrong. She is honest, patient, polite, with an engineer’s mind (she is a civil engineer). She deserves to be listened to much more than many of our career politicians who care little for the truth, only for their own advancement.